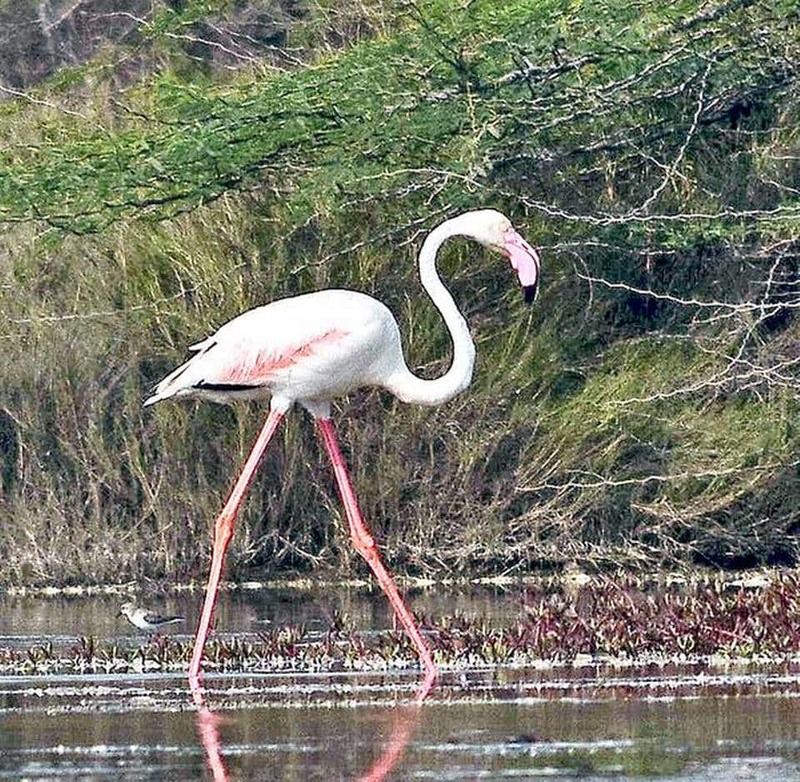 In a first during the past three decades, a greater flamingo was spotted in Visakhapatnam by birdwatchers last weekend, making it a unique discovery of the ongoing season. A solitary greater flamingo was found at the NTPC ash pond area by two birdwatchers— Janardhan Uppada and Harsha Vardhan K.— last Sunday. It was a very unusual sight. Initially, we mistook the bird for a painted stork. But when we zoomed in our lenses, we were surprised to see a greater flamingo. This species was never sighted earlier in this region in the recent past, Mr. Uppada told The Hindu. The recent discovery has delighted the birdwatchers. According to them, the solitary bird might have strayed out of the flock and lost its way while on the journey to its habitat. The long-legged and long-necked bird was last seen in Visakhapatnam in the 1980s. It is a significant development. Generally, the birds are always on the lookout for mudflats for nesting. We are planning to keep a track of the movement of this species. If the trend continues, we can conclude that the greater flamingos may be looking for an alternate food source here, Vikram Penmetsa, a member of Vizag Birdwatchers Society, said. The NTPC ash pond and its neighbouring wetlands attracts more than 15 avian species, some of which migrate in the winter such as Eurasian curlew, little stint, plovers and redshank. The recent spotting of greater flamingo in the area has brought the place in the limelight and highlighted the need to protect the wetlands and water bodies of Visakhapatnam, as they are important nesting zones for birds. Residents of west and sub-Saharan Africa, Mediterranean regions, south-west and south Asia, greater flamingos reside in mudflats and shallow coastal lagoons or freshwater marshlands. They feed on molluscs, blue-green algae and microscopic organisms. In Andhra Pradesh, Pulicat Lake is one of the biggest habitats for greater flamingos.